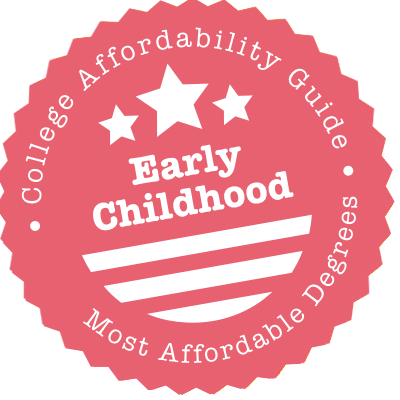 Scroll down to see the most affordable early childhood degrees, as well as info on the different types of early childhood degrees and early childhood program accreditation. The School of Education at UNC Chapel Hill offers a combined degree BA/MAT (Bachelor of Arts/Master of Arts in Teaching) that replaces its former undergraduate programs in Child Development and Family Studies, Elementary Education, and Middle Grades Education. The BA/MAT program allows students to complete their undergraduate and master degrees in five years. Graduates of this program can be licensed in Elementary Education (K-5). The School of Education also offers a Master of Education for Experienced Teachers (MEDX) program. This is a part-time, field-based program. Students who already hold active SP I or SP II licenses are eligible for advanced licensure in their specialty areas under this program. One of the licensure areas is Early Childhood Intervention and Family Support (B-K). Buffalo State SUNY's Department of Elementary Education and Reading offers a BS in Early Childhood and Childhood Education (birth-grade 6) and a BS in Early Childhood Education (birth-grade 2). An MS in Education in Childhood and Early Childhood Curriculum and Instruction is also available, as is an MS in Education in Childhood and Early Childhood Education with initial teacher certification. The BS in Early Childhood Education includes observation, tutoring and teaching experiences in a variety of settings. Early childhood education majors must also complete 30 credits in one of the following academic concentrations: American studies, English, foreign language, mathematics, science or social studies. Scholarships available through the Department of Elementary Education and reading include the Circle of Excellence Award and the Norma Sutter Award. Through its Department of Family Studies, Saint Cloud State University offers a BS in Early Childhood Education, an MS in Early Childhood Special Education and a graduate teacher licensure program in early childhood special education. The BS in Early Childhood Education curriculum incorporates the 79 credit hours of coursework required for the Minnesota Early Childhood Teaching License, including two semesters of student teaching. The MS in Early Childhood Special Education prepares students for employment in home-visiting programs for infants and toddlers with disabilities or as teachers in childcare and preschool programs for children with disabilities. Several scholarships are available to students enrolled in the Department of Family Studies, including the $1,000 Olga Satre Hart Scholarship for Education Students and the $500 Fati Zarghami Scholarship for CFS Student Teaching. Students admitted to the School of Education and Counseling at Wayne State College can choose to pursue either a Bachelor of Science (BS) or Bachelor of Arts (BA) in Early Childhood Education. Graduates of both programs are qualified to teach infants and children up to Grade 3. Education majors can apply for several scholarship programs, including the following: Alice Korth and Gale Bathke Annual Education Scholarship, Dennis and Marcia Hult Elementary Education Scholarship, and the Dr. Myrle and K. Leone Hemenway Education Endowed Scholarship. Iowa State University's School of Education offers an undergraduate major in early childhood education that is offered in collaboration with the Department of Human Development and Family Studies. The early childhood education curriculum prepares students to work with children from birth to grade 3 by teaching them how to guide and manage groups of young children, provide assessment and programming for children ages three through six, and adapt programming in inclusive settings. Students who earn the degree are eligible to receive the teaching endorsement for pre-kindergarten through grade 3, including special education and Pre-K through K early childhood special education. Scholarships available to early childhood education students include the full-tuition Branstad Scholarship and the Elizabeth Sisson Wych Scholarship. UF's College of Education offers a Unified Early Childhood Education - ProTeach program that lets students earn their BA and MA degrees in five years. This is a teacher certification program and graduates are eligible for the following: Preschool (birth to age 4) Certificate, Pre-kindergarten/Primary (3 years to grade3) Certificate, the Pre-kindergarten Disability Endorsement, and the ESOL (English for Speakers of Other Languages) Endorsement. Students on their fifth year of study under this program can apply for scholarship through Project Prepare, which awards up to $13,750. Two graduate programs have an Early Childhood Emphasis - Master of Education (M. Ed. ), which is a non-thesis master's degree, and Master of Arts (MA), which requires a thesis for completion. At the current time, there are five early childhood programs offered by the College of Education at UIUC. The Bachelor of Science in Early Childhood Education prepares graduates for teaching careers in preschool, kindergarten, and the early primary grades. The Department of Curriculum & Instruction offers a Master of Education (EdM) program for childhood education. In addition to earning their EdM degree, graduates qualify for early childhood teaching licensure. A Doctor of Philosophy (PhD) degree in child development is available from the Department of Educational Psychology. Students interested in special education can apply for admission to either the EdM or Master of Science (MS) program in infancy & early childhood special education offered by the Department of Special Education. Students interested in teaching young children can earn certification to teach children up to age 8 in the Early Childhood Education program offered by SUNY Fredonia. Undergrads can also earn dual certification in Early Childhood Education (Birth-Grade 2) and Childhood Education (Grades 1-6). Fredonia's teacher training emphasizes real-world experience from the freshman year. Students must perform four field experiences, spending four hours a week for eight weeks working as instructional assistants in a classroom for each required field experience. Fredonia offers an exchange program with a school in the United Kingdom and also offers student teacher placements in Australia. Graduate students who are certified to teach early childhood education can earn a master's degree in early childhood special education. Through its Department of Elementary and Early Childhood Education, Queens College offers an undergraduate major in elementary education that prepares students to teach grades 1-6. The elementary education major must be taken as a co-major and students in the program are required to complete a major in a liberal arts or science program as well. The Department also offers a Master of Arts in Teaching (MAT) in Early Childhood Education, which is a 45 credit program that prepares pre-licensure students to receive the New York State Initial Certificate in Early Childhood Education (birth-grade 2). A Master of Science in Education (MSEd) in Early Childhood Education is also available for students who have already attained their teaching certification. The University of North Carolina - Greensboro offers a B.S. in Human Development and Family Studies with a Concentration in Early Care and Education that can be completed on campus or entirely online as well as an M.Ed. in Birth through Kindergarten Interdisciplinary Studies in Education and Development, which is offered online. The Department of Human Development and Family Studies has over 400 undergraduate majors and 50 graduate students. The HDFS department offers assistantships, scholarships, and fellowships specifically for HDFS students. Tuition waivers, while in limited supply, may be available for some students. The Bachelor of Science (BS) program in Early Childhood Education at Towson University leads to a Maryland State Certification to teach children from birth through Grade 3. The college offers Master of Arts in Teaching (MAT) and Master of Education (M. Ed.) degrees, as well as an Early Childhood Education Certificate of Advanced Study. Graduates of the MAT program are eligible for initial teacher certification within the General Education Track of Early Childhood. The M.Ed. program is aligned with the NAEYC Standards for Early Childhood Professional Preparation in Advanced Programs. However, this program is not designed to lead to initial certification in Early Childhood Education. Students who wish to be eligible for this certification should pursue the M.Ed. Plus Certification option. The School of Education at SUNY Cortland is the largest comprehensive teacher education program in New York. The school offers a Bachelor of Science (BS) program in Early Childhood and Childhood Education (Birth - Grade 6). There is also a Master of Science in Teaching (MST) in Childhood Education (1-6) program. Students spend more than 100 hours in the field and are given opportunities to explore a variety of educational environments prior to becoming student teachers. SUNY Cortland's School of Education is accredited by CAEP (Council for Accreditation of Educator Preparation, formerly NCATE). Cal State Fullerton offers a Bachelor of Science in Child and Adolescent Development (CHAD) program for students who are interested in early care and education, elementary education, and in youth-oriented social service fields. Students accepted to the CHAD program can choose from the following options: early childhood development, elementary school settings, adolescent/youth development, and family and community contexts. The coursework for the program follows the professional standards set by the National Association for the Education of Young Children and meets the education requirements of the California Child Development Permit Matrix. Students who have overcome difficult circumstances in pursuit of their degree are nominated for the Kimberly Perkins Award for Dedication to Academic Excellence. This scholarship awards a $1,500 stipend. The Department of Teacher Education at Brigham Young University-Idaho offers a program in early childhood education/early childhood special education that prepares students to work with all children from birth through age eight, including those with special needs. After completing the program, students will be ready to earn the Blended Early Childhood Education/ Early Childhood Special Education Idaho Teaching License, which enables them to teach K-3 general or special education classes. BYUI's Early Childhood Education/Early Childhood Special Education program also requires that students complete five supervised teaching experiences, including the following: an early field experience; infants and toddlers in home and/or center-based settings; preschoolers in private or public preschools; kindergarteners in public schools; and first through third grade children in public schools. Northwest Missouri State University's Department of Professional Education offers a B.S.Ed. in Elementary Education with the option for certification in early childhood education and early childhood special education, as well as an M.S.Ed. in Early Childhood Education. Elementary education B.S.Ed. students who want to specialize their studies in early childhood education can complete a 30 to 31-credit early childhood education minor that certifies them to teach children from birth to grade 3. B.S.Ed. students who are already minoring in early childhood education can specialize their studies even further by taking an additional six to nine credits of coursework in early childhood special education. The M.S.Ed. in Early Childhood Education is a 32-credit program that also offers a six-credit specialization in early childhood special education. City College of New York has bachelor's and master's programs leading to degrees in early childhood education (ECE), including teacher licensure programs. The undergraduate program is offered by the Division of Interdisciplinary Studies at the Center for Worker Education, which accepts CCNY students into the ECE program after they take prerequisite courses and pass a test and interview. Completion of the program leads to a Bachelor of Science in ECE and eligibility for New York State Teacher Certification (birth-age 8). Graduate programs are open to certified teachers and those seeking to become teachers. Depending upon their background and goals, students can earn initial certification, professional certification, or earn a Master of Science in Education without certification. The Early Childhood Education (ECE) program at Hunter College prepares students for New York State certification to teach young children (birth to grade 2). To earn their degree, students will complete 36 credits and meet requirements for fieldwork and student teaching, which will be arranged in a variety of early childhood education settings around the state. The Early Childhood Education program is designed as a second major; students must select a primary major from a liberal arts or science subject area. To enter the ECE program, students must first apply to and be accepted by the School of Education, then submit a writing sample and be interviewed before they declare an Early Childhood Education major. The Department of Family Sciences at Texas Woman's University offers a Bachelor of Science in Child Development with Tracks, a Bachelor of Science in Interdisciplinary Studies EC-6 ESL Generalist, a Bachelor of Science in Interdisciplinary Studies EC-6 Generalist, a Master of Science in Child Development, a Master of Education in Early Childhood Education, and a Ph.D. in Early Child Development and Education. The child development/early childhood education program gives students the preparation to teach, work in the early childhood intervention field, work in private and public agencies focused on families and children, etc. The child development/early childhood education program has been approved by the National Council on Family Relations (NCFR). The Department of Educational Theory and Practice at UGA's College of Education offers a Bachelor of Science in Education (B.S.Ed.) program with Early Childhood Education as a major field of study. Students have the opportunity to study abroad through the department's partnership with the Consortium of Overseas Student Teaching Program. The department offers a Master of Arts in Teaching (MAT) program, with an early childhood education focus. This program is designed for non-certified candidates seeking initial teacher certification to teach in pre-kindergarten through Grade 5. There is also a Master in Education (MEd) program available, as well as a Doctor of Philosophy (PhD) program in Educational Theory and Practice, with an Early Childhood Education Emphasis. The College of Education and Human Development at the University of Massachusetts-Boston offers undergraduate and graduate programs for those interested in teaching infants and toddlers or children in Pre-K through grade 2. These programs include a Bachelor of Arts in Early Education and Care in Inclusive Settings and a Master of Education in Early Childhood. The B.A. program offers concentrations in early intervention, infant/toddler care and education, preschool education and care, administration and supervision, youth and community outreach, as well as early childhood licensure. The M.Ed. program is available in both licensure and non-licensure tracks of study. The initial licensure track is a 37-credit program that prepares students to teach children in grades Pre-K through 2. The licensure track is a 36-credit program designed for students who already have experience teaching children from infancy to age 5. The School of Education at Brooklyn College grants Bachelor of Arts degrees in Early Childhood Education Teacher (Birth-Grade 2) and in Special Education for the same age group. Graduate students seeking a Master of Science in Education: Early Childhood Education Teacher have three options. One option is for teachers who already have initial licensure in Early Childhood Education and enables them to receive New York State professional licensure. A second option allows a teacher with initial licensure in Childhood Education (Grades 1-6) or Special Subjects (all grades) to earn professional licensure in Early Childhood Education. The third option is for students without teacher licensure and allows them to earn both initial and professional certification in Early Childhood Education. The University of North Texas offers a Bachelor of Science in Interdisciplinary Studies (Elementary Education). This degree is offered for Early Childhood-6 Generalist, Early Childhood-6 Bilingual Generalist, Early Childhood-6 ESL Generalist, Early Childhood-6 Generalist (including EC-12 Special Education), Grades 4-8 English Language Arts with ESL, Grades 4-8 Mathematics with ESL, Grades 4-8 Science with ESL, and Grades 4-8 Social Studies with ESL. UNT also offers a Master of Science in Early Childhood Studies. All Teacher Education programs are accredited by the Council for the Accreditation of Educator Preparation. The Bachelor of Arts in Child Development program at Stanislaus has an early childhood professional track that prepares students for careers as curriculum specialists, program evaluators, or teachers and administrators of child development programs. Three other tracks (middle childhood, services, and general) are also available. Coursework covers topics such as child abuse and neglect, early cognitive development, professional issues in child development, and early social and emotional development. There is also a fast track program for students who already have their Associate of Arts in Child Development or Early Childhood Education degree. Liberal Studies students as well as those pursuing the Master of Arts in Interdisciplinary Studies degree have the option of selecting child development as their area of concentration. The Master of Arts in Early Childhood Education (MA-ECE) degree offered at Fresno State is accredited by the National Association for the Education of Young Children (NAEYC). It is the only program in California with this accreditation. All required classes for MA-ECE program are offered in the evenings and cover topics such as curriculum and assessment, concept development, diversity and inclusion, advanced educational psychology, and trends and issues in early childhood education. Fresno State also offers an Early Childhood Education Specialist Credential Program for students who have a current California elementary credential. Academically qualified education majors are considered for a number of scholarships (with variable amounts), such as the Dr. Robert Monke Scholarship and Kremen School of Education Alumni Chapter Scholarship. The Bachelor of Arts in Child and Adolescent Development degree at CSU Northridge offers options in applied development science and in early childhood development. Community college students who have completed the Lower Division Transfer Plan in Early Childhood Education will find the early childhood development option to be an ideal pathway to a BA degree. The curriculum includes coursework in health and society, principles of human behavior, development and learning in early childhood, and behavioral assessment and positive behavioral support. The department has an honors program and offers a minor in the field as well. Early childhood development majors can apply for a number of scholarships, including the Dr. Carol S. Kelly Endowment Scholarship ($1,000) and the CADV Alumni Chapter Scholarship ($500). The College of Education at San Diego State University offers a Bachelor of Science in Child Development degree. Certificate programs are also available in family life education and in early care and education. On the graduate level, the university offers a Master of Science degree in child development, as well as a post-graduate, one-year Early Childhood Socio-Emotional and Behavior Regulation Intervention Specialist (EC-SEBRIS) certificate program. Graduate students have the option of adding a concentration in Early Childhood Mental Health to their MA program. This MA concentration qualifies graduates to pursue clinical licensure under the Board of Behavior Sciences - License Professional Clinical Counselor (LPCC). Child development students can apply for the Mary M. Donaldson Scholarship Fund, which covers tuition, fees, and books. The College of Education at the University of South Florida is accredited by CAEP (Council for Accreditation of Educator Preparation, formerly NCATE). There is a Bachelor of Science (BS) in Early Childhood program available. Graduates of this program are eligible for licensure in Early Childhood Education Pre-Kindergarten/Primary (age 3 - Grade 3). The college also offers a Master of Education (M.Ed.) in Early Childhood program with a focus on social justice and advocacy. This program is designed for practicing teachers and is not an initial teaching certification program. There is a Doctor of Philosophy (PhD) program offered that allows students to choose an early childhood emphasis. Early childhood education (also known as ECE) involves teaching and caring for children from birth-8 years. Along with a love of the job, early childhood educators have an instinctive connection with young minds. They’re creative, patient and sensitive, fun communicators and innovative curriculum developers. They may collaborate with other educators to create course plans and activities; they often work in teams to teach lessons. So how do you start? The answer depends on what kind of early childhood educator you’d like to be. To help you through the maze, we’ve divided our guide into sections. First, we cover the basics – job descriptions, education and professional certification requirements. Second, we take a close look at what each ECE degree entails. Then we explain exactly how accreditation, state licensure and the CDA credential may apply to your situation. Daycare workers take care of infants and toddlers. They play with them, keep them fed, stimulate their minds and see to it that they stay healthy and happy. Daycare is not a formal learning environment like preschool. Some daycare centers are in public buildings; others are in homes. After working with infants and toddlers or raising your own children, you may also decide to run a daycare center. A high school diploma or ECE certificate is usually required for entry-level daycare jobs. If you’re interested in leadership positions, an associate’s degree in ECE is helpful, and is the minimum requirement for most administrative positions. CPR and first aid certification may also be needed. Note: Learn more about wages and job outlook on the BLS’s Occupational Outlook Handbook: Childcare Workers. Unlike the relatively loosey-goosey structure of daycare, preschool is a child’s first formal learning environment. Preschool teachers are deeply invested in a child’s growth, including the development of all-important social, physical and cognitive skills. They stimulate a child’s imagination at the same time as they introduce them to ideas like letters and numbers. Government doesn’t mandate preschool, so it’s currently not subject to as many rules and regulations as elementary schools. A lot of preschools – except for the Head Start Program, state programs and similar public efforts – are privately run and financed through tuition and donations. For publicly funded preschools, a certificate in ECE or an associate’s degree in ECE is the typical minimum. A bachelor’s degree in ECE may be preferred, and is often required to become a preschool director. There are no mandatory requirements for private preschools, although a high school diploma is often expected. Public preschool programs require teachers to be licensed by the state in early childhood education. A private preschool (e.g. church-run) may have no licensure requirements. However, the CDA and a number of state licenses can prepare you for teaching children from birth to age 5. Note: Learn more about wages and job outlook on the BLS’s Occupational Outlook Handbook: Preschool Teachers. Developed by Dr. Maria Montessori, the Montessori method of learning takes a student-centered, “self-motivated” approach to education. It focuses on fostering a child’s creativity, independence and curiosity. Instead of leading discussions, teachers help each student explore different academic areas and personal interests. Montessori classrooms are a blend of children ages 2-8. Older students learn how to teach and socialize with younger peers; younger students learn new skills from their older compatriots. Bachelor’s degree, preferably in child development or early childhood education. There is no state licensure requirement. However, teachers must complete the Montessori teacher education program. Head Start is a federal program that was founded to help low-income children ages 5 and under. Head Start educators are deeply involved in the overall growth of their students. In addition to teaching key skills in literacy, language and socialization, they support each child through his/her unique educational journey. For Head Start teachers, an associate’s degree is acceptable if you have preschool teaching experience. Otherwise, you will need to hold a bachelor’s in early childhood education. Head Start assistants must currently have a CDA credential, or be enrolled in a CDA program and complete it within 2 years. Alternatively, an assistant can hold an associate or bachelor’s degree in any field and be enrolled in an early childhood degree program. CDA with a preschool endorsement for a center-based setting or a state-awarded credential for preschool teachers that exceeds CDA requirements. Kindergarten is the practice ground for elementary school. Teachers are there to help kids transition into a more structured environment. Although creativity and play are still an important part of the curriculum, kindergarten incorporates more academics into the day than preschool (e.g. basic mathematics, spelling and writing). Bachelor’s degree in ECE to become a lead teacher. Associate’s degree in ECE to work as a teacher assistant. In most states, kindergarten is part of the public education system. Therefore, kindergarten teachers must obtain a state teaching license to work in public schools. Note: Learn more about wages and job outlook on the BLS’s Occupational Outlook Handbook: Kindergarten and Elementary School Teachers. Working with students of all abilities, elementary school teachers start to reinforce the foundations laid in preschool and kindergarten. They help children advance their skills in mathematics, science, language and social studies, and encourage them to become confident in their abilities. To exert influence on the curriculum or school policy, some teachers choose to become part of the administration. In contrast to public schools, private elementary schools create their own set of rules and curricula. Teachers often have more autonomy in the classroom and the resources to create unique learning experiences. To earn a job, you will need to show potential employers you have a solid education, a passion for teaching and experience working with children. A state teaching license may or may not be required. Please check with the individual job description. This is our catchall category for jobs that require more education and experience. These can include titles like curriculum specialist, early childhood development researcher, professor of early childhood education and school administrator. Most early childhood educators decide to pursue these positions after they spend a few years gaining professional experience in the field. Master’s in ECE or Elementary Education at minimum. To teach at the university level, a doctorate is usually required. Please check individual job descriptions to determine requirements. For example, schools may ask you to earn a specialized state license in your area (e.g. school administration, special education, etc.) if you are interested in a public school position. A certificate in ECE is a 1-year “starter” qualification for early childhood educators. Courses tackle important subjects like child growth and development, as well as practical methods for fostering physical, emotional and social skills. Applicants should have a high school diploma or GED. Some students earn a certificate to qualify for entry-level jobs in a daycare facility, after school center, summer camp or a similar setting. They may work as tutors, private nannies or aides for children with special needs. Others use it as a step towards an associate’s degree or a CDA credential. If you’re interested in the last two options, make sure your course credits will be transferable. Note: For more information on graduate certificates in education, see our article on K-12 Education Degrees. An associate’s degree in ECE is a 2-year undergraduate program focusing on both the theory and practical aspects of early childhood education. In addition to child growth and development, courses may cover teaching topics such as curriculum and literacy development. Applicants should have a high school diploma or GED. Associate of Arts (AA) or Associate of Science (AS) in ECE A common choice for those interested in a bachelor’s degree down the track. Associate of Applied Science (AAS) in ECE: A common choice for those interested in going straight into the workforce. An associate’s degree can qualify you for lead positions (e.g. director) in daycare or preschool, and for working as a teacher assistant in public schools. On the other hand, public elementary schools expect you to have a bachelor’s degree to become a licensed teacher. If you’re using the associate’s degree as a step towards a bachelor’s degree, make sure your course credits will be transferable. Note: Looking at an associate’s degree in elementary education? See our article on K-12 Education Degrees. A bachelor’s degree in ECE is a 4-year undergraduate program that comprehensively covers early childhood education. Courses may include child development, classroom management, special needs and methods of assessment/evaluation. Most bachelor’s programs include a good deal of field experience – in other words, student teaching in classrooms or early childhood settings. Bachelor of Arts (BA) in Early Childhood Education: Often incorporates college-level humanities courses. Bachelor of Science (BS) in Early Childhood Education: Often incorporates college-level math and science courses. You don’t necessarily need a bachelor’s degree for childcare or preschool positions, but it becomes important if you wish to teach older children. Public kindergarten and elementary schools require teachers to have an accredited bachelor’s degree and a state teaching license. Head Start and Montessori programs often prefer it. A bachelor’s degree also sets you up for further education (i.e. a master’s) and positions of responsibility (e.g. school administration) down the line. Note: Interested in a bachelor’s degree in elementary education? See our article on K-12 Education Degrees. A master’s degree in ECE is a 2-3 year graduate program that builds on educational foundations laid in the bachelor’s degree. Accelerated programs only take 12-18 months to complete. In most programs, you will take high-level college courses in early childhood education and complete a research project on an ECE topic (e.g. curriculum and instruction, educational administration, child development, early learning, etc.). You may also be expected to participate in field experiences or practicums (e.g. supervised teaching). Once you start looking, you’ll find a raft of choices for your master’s degree, including the MAT, MEd, MA or MS. We go into much greater depth about these options in our article on K-12 Education Degrees. This degree is a common choice for teachers who wish to climb the career ladder, increase their salary and/or work in supervisory positions such as administration. A doctorate in education is a 4-7 year program focused on advanced research and practice, and the highest educational qualification you can achieve. Unless you decide to tackle a combined master’s/PhD program, you must hold a master’s degree. We take a close look at all your degree options (e.g. PhD vs. EdD) in our article on K-12 Education Degrees. You may wish to pursue a doctorate if you’re interested in top leadership/administrative positions, policy work, teaching early childhood education at a university or research. Alternative teacher certification programs are intended for graduates who already hold a bachelor’s degree in a subject other than education and are interested in initial teacher licensure. For more information on these programs, please see our article on K-12 Education Degrees. Add-on certificate/endorsement programs are targeted towards licensed teachers who wish to teach in a new field (e.g. TESOL, special education, etc. ), subject area (e.g. science) or grade level and have this skill endorsed on their teaching license. For a detailed look at these programs, please see our article on K-12 Education Degrees. When you’re weighing up schools, we strongly recommend you attend a college or university with regional accreditation. This is a “seal of approval” granted to non-profit and public institutions by one of six regional accrediting bodies (e.g. New England Association of Schools and Colleges). Regional accreditation is only granted to the school, not to individual departments or degree programs. If you’re interested in the quality of the early education program, you can also see whether it has CAEP/NCATE/TEAC accreditation. Interested in becoming an elementary school teacher? Keep an eye out for these acronyms. In 2013, the National Council for Accreditation of Teacher Education (NCATE) and Teacher Education Accreditation Council (TEAC) merged into one organization for accrediting teacher education programs. It is called the Council for the Accreditation of Educator Preparation (CAEP). All programs currently accredited by NCATE and TEAC will eventually be accredited by CAEP. In the meantime, you can look for NCATE or TEAC on the university’s website. Is NCATE or TEAC Accreditation Necessary? No. Nevertheless, it shows that an education program has met a variety of quality standards. Considering a program that isn’t accredited by NCATE or TEAC? Just make sure it has high graduate placement numbers and a solid reputation within the teaching field. Although this accreditation doesn’t relate to the quality of a university, it’s an important one to know about. In 1985, the National Association for the Education of Young Children (NAEYC) decided to create an accrediting system that would assess the quality of early childhood programs (e.g. preschool, childcare centers, etc.). Programs pursuing initial accreditation must complete a four-step accreditation process and meet 10 program standards. One of those standards is excellent teaching. That means educators at an NAEYC-accredited childcare program must hold the CDA or be enrolled in an ECE degree program or hold an ECE degree plus experience and relevant training. It’s something to consider if you’re looking at jobs in your area. To teach in a public school, you must obtain a teaching license issued by your state education agency, department or board of education. Irritatingly, the terms “teacher certification” and “teacher licensure” are used interchangeably in the field of teaching. They mean the same thing. A state teaching license is not required for private preschool or pre-K institutions. Find your State Department of Education. Early childhood educators usually pursue the state license/certificate that allows them to teach K-Grade 3 or Elementary Grade 2-Grade 6. Some states (e.g. Arizona) offer licenses in areas like “Early Childhood Education: Birth through Age 8 or Grade 3.” Others (e.g. Oregon) offer endorsements such as Early Childhood Intervention, Basic Early Intervention Special Education I, etc. You will have to look at your individual state to learn all the options, but we have a link for that! Early Childhood License Options Listed by State. Some universities incorporate teacher training into their degree programs, but not all do. So it’s important to check that your program will meet state licensing criteria. Note: For a comprehensive look at teaching licenses, including explanations of endorsements and advanced licenses, see our article on K-12 Education Degrees. In addition to a teaching license, which is required to teach in public schools, you might wish to seek voluntary certification from independent organizations like the National Board for Professional Teaching Standards (NBPTS). Board certification can set you up for leadership opportunities, pay raises and more. NBPTS offers general certification in early childhood education and a variety of subject-specific ECE certifications (e.g. music, art, reading, ESL, etc.). Voluntary certifications like NBPTS won’t help you become a certified/licensed teacher. It’s confusing because the terms “teacher certification” and “teacher licensure” are used interchangeably. The important thing to remember is that your state department of education or agency is the only body that can approve you as a certified teacher and grant you an official license to teach in public schools. The Childhood Development Associate (CDA) credential is an entry-level ECE credential issued by the Council for Professional Recognition (CPR). The National Association for the Education of Young Children (NAEYC) considers a minimum of 12 credits of coursework in child development, ECE, or early childhood special education as the equivalent of a CDA. To earn the CDA credential, you must submit proof of 120 hours of formal ECE professional education (many schools offer CDA preparation certificates/programs), 480 hours of professional experience in the appropriate age group, a professional portfolio and family questionnaires. Once your application has been reviewed, a CDA professional development specialist will conduct a verification visit. He/she will observe you in the classroom, conduct an oral interview and review your supporting documentation. You will also be required to take the CDA exam. If you pass these hurdles, you will be granted a credential. All programs, no matter where they are located, include an academic component and a practicum. For teachers, the practicum consists of a year-long internship guided by a supervising teacher and an outside Montessori consultant.